Not only is it the weekend but it's also the RHS Chelsea Flower Show next week. Double yay! Every year I get glued to the daily updates from the horticultural haven that blooms each year at Chelsea. 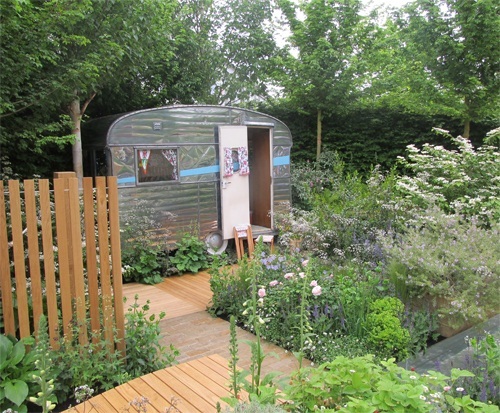 This image, The Caravan Club's Celebration of Caravanning Garden by Jo Thompson, is from last year's show. Not only is it Chelsea's 100th anniversary this year but there will be also a garden by Prince Harry's charity Sentebale which will reflect the Prince's experience of loosing his Mum. Sentebale is a charity which helps vulnerable children many of whom are orphans, in Lesotho, an African country which Prince Harry visited during his gap year. I can't wait to see it and the other gardens on Monday. Have any of you ever visited this show? I'd love to hear about it. I love watching the Chelsea flower show too....but I would not be tempted to visit....it looks so crowded I think you get to see the gardens better on the telly. I do love a bit of Alan Titchmarsh. My garden has at long last mad a spurt of growth, well worth waiting for. Loved visiting The Chelsea Flower Show (it's one of those things you just have to do at least once!) Crowded, hot, muddy, exhausting, but exciting.